We belong to a short-lived genus or species… All our cousins are already extinct. What’s more, we do damage. Explaining the complex with relatable simplicity to make sense of ideas that seem too big to grasp is the methodology that leading theoretical physicist Carlo Rovelli applies to the writing of his slim book, which aims to show ‘those who know little or nothing about modern science’ that musing on the mysteries of the world need not be for the chosen few. First finding life as a series for the culture section of an Italian newspaper, Rovelli’s book initially left Fifty Shades of Grey in the dust on publication in Italy. The lessons cover Einstein’s general theory of relativity, quantum mechanics, the architecture of the cosmos, elementary particles, gravity, the nature of the mind and black holes. One of the founders of loop quantum gravity theory, Rovelli, author of Reality is Not What It Seems, is the director of the quantum gravity group at the Centre de Physique Theorique of Aix-Marseille University in Provence, so it is particularly admirable that he writes on these heavy subjects with a light touch that is, relative to the subject, both vivid and entertaining. But there are no definitive answers here. Rovelli lays the basics out to be consumed, but also explains the open-endedness of it all, even for each field’s experts. You can order Carlo Rovelli's new book, The Order of Time, now. One of today’s most exciting and dynamic science writers, Carlo Rovelli is an Italian theoretical physicist and philosopher whose work primarily focuses on the physics of time and space. 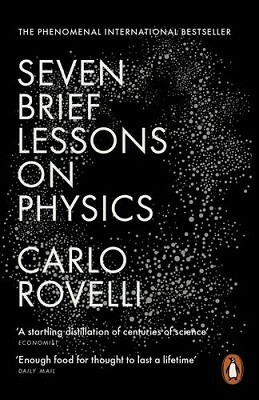 Currently head of the quantum gravity group at the Centre de Physique Théorique at Aix-Marseille University, Rovelli became a household name after publishing his first books, Seven Brief Lessons on Physics and Reality Is Not What It Seems, which became international bestsellers. Like Stephen Hawking before him, Rovelli excels at making complex ideas accessible and inspiring; ‘I try to write at several levels,’ he explains, ‘but I keep the person who knows nothing in my mind’. His latest book is 2018’s The Order of Time. It has left me hungry for more reading on the subject.